Christmas! The house is festively decorated and inside it is snug and cosy. The table is nicely set, the Christmas tree cheerfully decorated and the candles are lit. In every corner of the house you will find beautiful Christmas items and decorations. Please note: these decorations can be dangerous for your animal! Did you know, for example, that pine needles are poisonous? Make sure your animal is not allowed to eat the needles and do not place the food and drink bowl too close to the Christmas tree. More tips for a fun, enjoyable Christmas? Then read on! First of all, take a look at the plants in your house. There are several plants that can be found around Christmas or that are used as Christmas decorations, but that are toxic to your pet. The poinsettia (Euphorbia pulcherrima) can cause temporary gastrointestinal complaints (vomiting, unwilling to eat, lethargy). Holly (Ilex aquifolium) can cause gastrointestinal complaints (salivation, vomiting, diarrhoea, unwillingness to eat) when it is absorbed in large quantities. In general, the symptoms are transitory. Christmas rose (Helleborus niger) is also quite poisonous. It contains natural heart glycosides that make the heart beat more vigorously. Ingestion, like other plants, can cause gastrointestinal complaints, as well as drowsiness, paralysis and cardiac dysrhythmia. Mistletoe (mistletoe, Viscum album) can cause vomiting and diarrhoea in small amounts. With higher intake, more severe symptoms can occur (fast, heavy breathing and shock) with even eventually death of your pet as a result! Amaryllis (Hippeastrum), of which both the bulb and the plant are poisonous. Ingestion can cause gastrointestinal tract problems and irritation of skin and mucous membranes. Cyclamen can cause symptoms such as vomiting and diarrhoea, but also respiratory problems and swelling of the tongue. If your animal has eaten on a poisonous plant or another plant of which you are not sure, always contact your vet! Of course we all love to have a beautifully decorated Christmas tree in the house. However, did you know that pine needles are poisonous? Be careful with pine needles that fall on the ground. Make sure your pet can't eat these needles and don't place the food and drink bowl too close to the Christmas tree. If you have a Christmas tree that is standing in water, it also means that this water contains toxins that the tree releases. Make sure that your pet cannot drink this water. When in doubt whether you can keep an eye on all these things, an artificial tree can of course offer a solution. 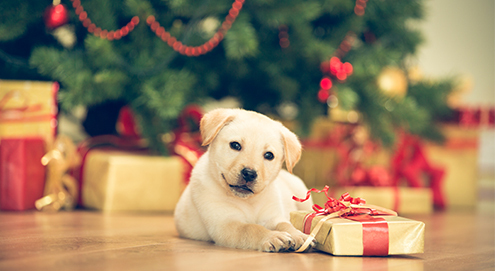 Decorations in the house and hanging in the tree, such as (glass) balls and light cords can stimulate your animal to play. Edible (tree) decorations can also be tempting for your pet. Hanging hooks for balls can be eaten and the intestine can be perforated. Light cords can be bitten to pieces and provide power. Christmas wreaths with chocolate are toxic to your animal. In addition, the tree can also fall over if your animal tries to take the decoration out of the tree. So think carefully which decoration you will use in your house and where! Be careful with burning candles. If your animal has eaten something, always contact your vet and try to indicate how much your animal has eaten! Don't let the rolls, bones, champagne corks, etc. sway as they can be eaten and can cause blockages in the intestine. This is of course only a brief overview of the most common dangers around the holidays. If your animal has eaten something you don't trust or something has happened that makes you doubt if this can harm your animal, always contact your vet! We wish you happy (and safe) holidays! Are you looking for a nice Christmas present for your dog or cat? Have a look at our range Christmas for Dogs and Cats. Sweet and soft Christmas cuddly toy for your dog. Box with delicious Christmas treats. Enjoy the countdown to Christmas along with your cat. 24 days of delicious treats for your small animal.